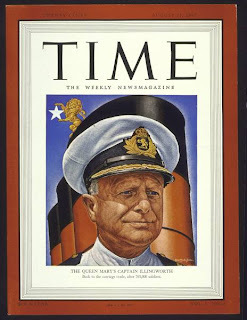 On this day in 1947, the RMS Queen Mary, her murals uncovered and her staterooms restored, resumed passenger service after serving as a troop ship for the previous seven years. To celebrate the occasion, crowds of well-wishers turned out to wave good-bye, and a local band played Rule Britannia as the giant Cunarder departed the Southampton docks. 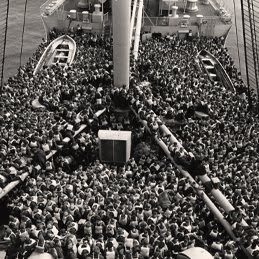 The last time she departed as a passenger ship, it was 1939 and the world was a different place. 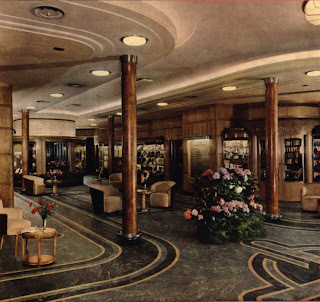 Gone, at least on this first voyage, was the glitter and decadence of the illustrious passengers who so commonly were found in the ship's salons in the pre-War years. Many of the travelers now were parents of British girls who had moved to the United States after marrying American soldiers. And among the first-class passengers, more than a few were going overseas for the first time--though there was a modest sprinkling of lords, politicians, and prominent business types aboard as well. On the bridge for the Mary's return was Captain Cyril Gordon Illingworth. Despite his 44 years at sea, the captain still found occasions for exuberance. Maintaining his position on the bridge as the ship approached a fog bank, he exclaimed, "Look at that patch of sunlight. Did you ever see anything like it?" Some in those post-War years would see the Queen Mary in exactly the same way. The Cunard White Star Line has announced the addition of many new luxury features in the conversion of the 81,235-ton Queen Mary, the world's fastest liner. Not only has the Queen Mary been restored to her former beauty, H.P. Borer, general manager of the line said, but many new features have been introduced. These include addition of new public rooms, air-conditioning and more public rooms and increased space for crew. Former passengers on the 1,018-foot Cunarder will find most noticeable changes on the promenade deck where the starboard gallery has been replaced by a motion picture theater seating 200 persons. The return of the Queen Mary will mark the first time that the two Queens and the Mauretania have been in luxury service together. Cunard officials termed it a most fitting manner of celebrating the one hundred and seventh anniversary of regular steamship service which it inaugurated July 4, 1840, with the sailing of the RMS Britannia, a 207-foot, 1,154-ton paddle steamer. The Britannia, carrying 64 passengers, made the journey from Liverpool to Halifax in two weeks. This is in marked contrast to the Queen Mary, which has crossed the Atlantic in less than four days. New ships under construction and expected in service by late summer and fall respectively are the Media and Parthia, postwar passenger cargo liners of 14,000 tons. Mr. Evelyn Howard-Jones, the distinguished English pianist, who arrived in New York on the R.M.S. 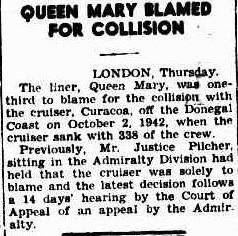 Queen Mary on Monday, is expected shortly in Toronto, where he will be the guest of Mr. and Mrs. Alfred Chapman.